Just like a good red wine, in order to craft an exceptional product, you need to start with the best components. And so our Paarl Shotgun Sling is crafted from the best quality top grain vegetable tanned leather we can find. It is self dyed and hand rubbed with our very own mixture of beeswax, animal fat and vegetable oil for a classic old school look. A simple yet effective sliding loop quickly and easily fastens your sling to the barrels and stock of your shotgun, making your sling adjustable to fit almost all shapes and sizes. We have also added an adjustable solid cast brass buckle which we import from the UK. To ensure durability and comfort, the sling is cut from full grain leather and is painstakingly hand stitched by our team of local craftswomen. Hand made and made to last, we at Els & Co. strive to deliver an experience in product quality that embodies the essence of Africa and that will last a lifetime. 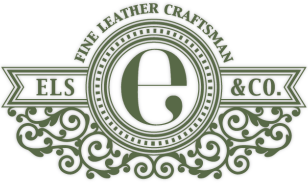 Any of our custom made items can be personalised for that extra touch by having your name or family crest laser engraved onto the leather.